Promotes reliable, steady bulk material flow. Low coefficient of friction. No moisture absorption. Reduces or eliminates arching, ratholing and erratic flow. Offers a combination of excellent machinability and low surface friction with outstanding wear and corrosion resistance. FDA & USDA approved, REDCO™ UHMW reduces material hang ups and enhances material flow; increasing your production and your profits. Designed for use in impact, abrasive, low temperature, and gritty environments; resulting in a material with elasticity and memory with a large range of hardnesses. Ideal in locations where material impact, impingement wear and directional changes are causing excessive wear or material deflection is required. 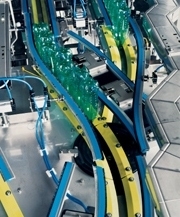 Proven to increase production by promoting material flow of congested materials due to its low surface friction. Redco™ Tivar® 88 liners are the perfect solution when you need to reduce or eliminate arching, ratholing and erratic material flow challenges. The ultimate material for high load, high speed and severe sliding abrasion applications. Composed of virgin polymer and premium additives, Redco™ Tivar® Ceram P® is a shatter-resistant alternative to ceramics, reducing wear and machine maintenance downtime. Redco™ Tivar® 88-SR is an ideal material to use when potentially volatile conditions exist, such as those in grain elevators and munitions plants, effectively safeguarding against static discharges. In addition, it resists heat and protects robotics and other products that are sensitive to dust accumulation and electrical charge buildup. Where you need the material to be conductive, Redco™ Tivar® 88-SR provides a surface resistivity of <10.5. Installing Redco™ Titanium reduces material hang ups and increases material flow, increasing your production and your profits. This premium grade material provides the ultimate protection for applications in chutes, silos, cyclones, spoon liners, hoppers, bins, bunkers, etc. Improve the quality of your grain product and increase production by eliminating arching, ratholing and grain segregation with a pipe, spout or chute lining solution designed by Redco Lining Systems. Redco™ Tivar® 88-SR (Electro Static Dissipative) is an ideal material to use when potentially volatile conditions exist, such as those in grain elevators and munitions plants, effectively safeguarding against static discharges. In addition, it resists heat and protects robotics and other products that are sensitive to dust accumulation and electrical charge buildup. Where you need the material to be conductive, Redco™ Tivar® 88-SR provides a surface resistivity of <10.5. Redco™ Tivar® 88 LINERS are ultra slick and abrasion resistant; improving material flow, which can eliminate material building up in many places within your production process. Tivar 88 liners are ideal more demanding lining applications with severe sliding and high load applications. Redco™ Tivar® CERAM P® will reduce wear and prolong equipment life. Large or small, Redwood Plastics can design the most optimal liner for your application that requires little or no maintenance with easy installation. Solve your bulk material arching, bridging, segregation or flooding problems with a lining solution designed by Redco Lining Systems. Whether the bulk materials you handle are fine and dusty; caking; cohesive or abrasive; the Redco Lining Systems Team will analyze and design a lining solution for your chutes, storage silos, transition hoppers, etc. Redco™ Tivar® 88 Liners are ultra slick and abrasion resistant; improving the flow of your material. Redco™ Tivar® Ceram P® will reduce wear and prolong equipment life in demanding applications with severe sliding and high load applications. Eliminate sticking and material hang-up problems to speed up turnaround tines and increase efficiency hauling capacity. The Redco Lining Systems Team designs solutions for bottom dump and rotary railcars as well as wall liners to protect cars from structural damage. By utilizing Redco™ Tivar®88 liners in the bottom of dump railcars or rotary dump railcars, turnaround times can be reduced by as much as 50% and carry-back can be virtually eliminated. Utilizing Redco™ Tivar® 88 &/or Redco™ Tivar® Ceram P® keeps bulk materials moving by eliminating arching and ratholing. Redco™ Tivar® 88 with Burnguard™ has flame retardant properties; self extinguishing when the source of combustion is removed. Redco™ Tivar® 88 with Burnguard™ meets MSHA 1C-112/1 for underground mining and has a UL94 V-0 flammability rating. Redco™ Tivar® 88 liners are ideal for bins, bunkers, hoppers, chutes, silos, discharge feeders, etc., helping you achieve mass flow, increase output capacity and eliminate coal stagnation. Stagnant coal problems increase your risk of spontaneous combustion, Redco™ Tivar® 88 liners eliminates congestion, so your product flows smoothly and consistently, helping the plant maximize electrical output and reduce safety and maintenance issues. Redco™ Tivar®88 &/or Redco™ Tivar® Ceram P® liners are available for bins, bunkers, chutes, discharge hoppers, etc., that promote consistent, reliable flow, reducing or eliminating variations in final product quality. Redco™ Tivar® 88 &/or Redco™ Tivar® Ceram P® liners eliminate arching and ratholing during cement processing. With its low coefficient of friction, Redco Lining Systems promote consistent flow; resulting in consistent cement quality. 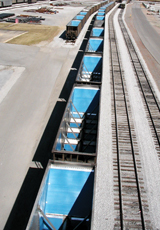 The Redco Lining Systems Team designs unique application specific lining solutions for chutes, hoppers, pan feeders, etc., that promote mass flow. Limited funnel flow, material build-up, segregation and fine particle abrasion/corrosion slows production. The Redco Lining Systems team has a lining solution to eliminate these problems and achieve mass flow. Redco™ Tivar® 88, Redco™ UHMW & Redco™ Tivar® Ceram P® liners can be installed into units; including bins, silos, tanks, as well as, feeders and piping for liquids, powders and solids. Hang ups are hold ups that cause frustrations and stop production. Worn paint and gummed up rollers slow down packages and cause congestion. Paint on liners wear out quickly and cause damage to rollers and packaging and require continual cleaning and dusting, increasing maintenance costs. Redco™ Tivar® Dryslide keeps packages moving; even on humid days, and has been proven to save weeks of downtime per year in replacement and maintenance costs. Redco™ Tivar® Dryslide is long wearing with an ultra slick surface and antistatic properties. 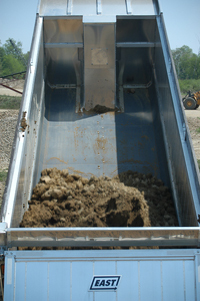 We have a variety of truck liners to suite whatever you are hauling; gravel, rock, excavation residue, hot asphalt, etc.. Redco™ Truck Liners are available in Redco™ Tivar® 88, Redco™ Durapro®, Redco™ Matrox™, Redco™ Quicksilver®. 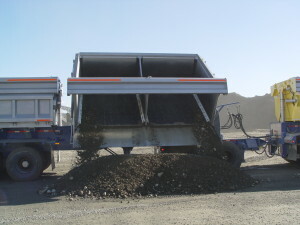 Redco™ Tivar® 88 Truck Liners eliminate material hang up concerns in a variety of environments and applications; including gravel, road cinders, wet and frozen soil, limestone and leaves. Withstanding high impact; two times the wear of steel and four times the wear of aluminum for on-road, off-road or heavy equipment trucks. 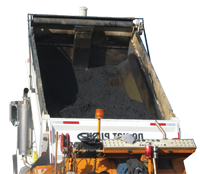 Redco™ Quicksilver® Truck Liners are specially formulated, super slick, abrasion resistant and guaranteed to withstand any temperature asphalt. 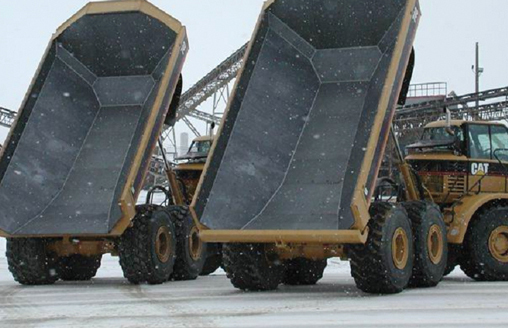 In hot or cold environments Redco™ Quicksilver® Truck Liners release sticky materials, meaning faster load release, less equipment damage, reduced chance of tip-over, less wear on hoists, minimal clean-up and reduced downtime. Redco™ Matrox™ has the impact strength, slickness and abrasion resistance required for all aggregate loads, but is also designed to withstand loads as hot as 350°F. Redco™ Matrox™ is backed by a two year warranty when properly registered. 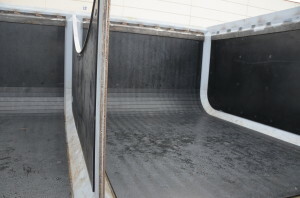 Asphalt Plant Chutes, Bins, & Hoppers can also be lined to obtain maximum flow. Redco™ Durapro® continuous length, seamless dump body liners release sticky materials such as clay, coal fly ash or fertilizer in the very best and very worst conditions, eliminating costly flow agents, reducing labor costs and increasing the number of loads hauled each day. 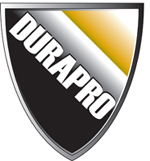 *Tivar®, Tivar88®, Quicksilver®, Burnguard™, CeramP® and Durapro® are registered trademarks of Quadrant EPP. Matrox™ is a registered trademark of Roechling Engineering Plastics, Redco™ is a registered trademark of Redwood Plastics Corporation.